Entrepreneur Chris Larson (B.S., ’84, Alum of the Year ’04) addresses the crowd at a University celebration on April 4. San Francisco State University yesterday unveiled plans for major investments in programs, initiatives and infrastructure, made possible through the success of its first comprehensive fundraising campaign. The “BOLD Thinking” campaign has achieved more than 91 percent of its $150 million goal, including two $25 million lead gifts: one to the College of Liberal & Creative Arts and one to the College of Business, the largest single gifts in the University’s history. The announcements were made at a University celebration held last night at San Francisco’s Masonic Center. The event featured remarks by University President Leslie E. Wong, former San Francisco Mayor Willie L. Brown Jr. (B.A., ’55) and campaign chair and San Francisco advertising executive John Gumas (B.A., ’84), among others. 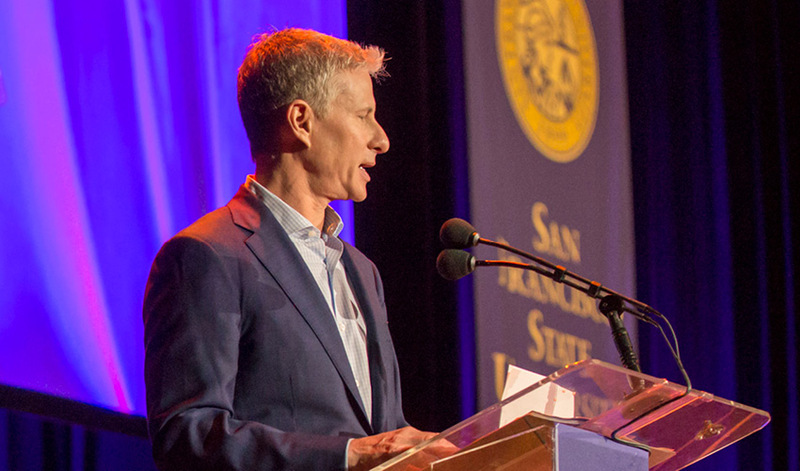 As a reflection of that influence and impact, Wong announced a history-making gift of $25 million to the College of Business by alumnus Chris Larsen (B.S., ’84, Alum of the Year ’04), his wife Lyna Lam and Rippleworks, a nonprofit foundation launched in 2015 by Larsen and Doug Galen which supports high-growth social ventures around the world. Larsen, as an alumnus, and Lam, whose two sisters and several other family members attended, are longtime supporters of SF State. The gift will be largely made through the digital asset, XRP, and is believed to be the largest gift ever made in a digital asset to a university in the U.S. In honor of the donors’ generosity, SF State plans to name the University’s College of Business the Lam Family College of Business, pending approval from the California State University Board of Trustees. Larsen, an SF State College of Business graduate, is a leading authority and visionary on digital assets, having co-founded Ripple, a global blockchain company, in 2012. He was the co-founder of Prosper, the first peer-to-peer lending marketplace in the U.S., which was inspired by hui, a Vietnamese community-oriented form of lending long practiced by Lam’s Cambodian family. Lam is active in the Bay Area community, having founded Watt Kampuchea Krom, a Khmer Buddhist Temple Foundation. The Lam-Larsen’s gift will support the “Lam-Larsen Fund for Global Innovation” and two endowed chairs. The focus of these funds is to support students in learning about and becoming changemakers of local and global entrepreneurial and fintech ecosystems. The evening also acknowledged the extraordinary, longtime support of alumni George (B.A., ’65) and Judy Marcus (B.A., ’62), whose previously announced $25 million gift to the campaign last fall will support the College of Liberal & Creative Arts, including its renowned School of Cinema and its Department of Creative Writing. The couple has had a lifetime of personal and professional achievement together, and they have been robust supporters of the creative arts, humanities and athletics at SF State. Gumas delineated the campaign’s priorities: empower students, champion faculty, energize programs and modernize and expand facilities. He noted that a comprehensive Campus Master Plan is underway which outlines a residential campus that is socially, environmentally and financially sustainable. The University has embarked on several major capital improvement projects, including a new 75,000-square-foot Liberal & Creative Arts Building and modernization of science, business, library and athletic facilities. For more information about the “BOLD Thinking” campaign, please visit the campaign website.